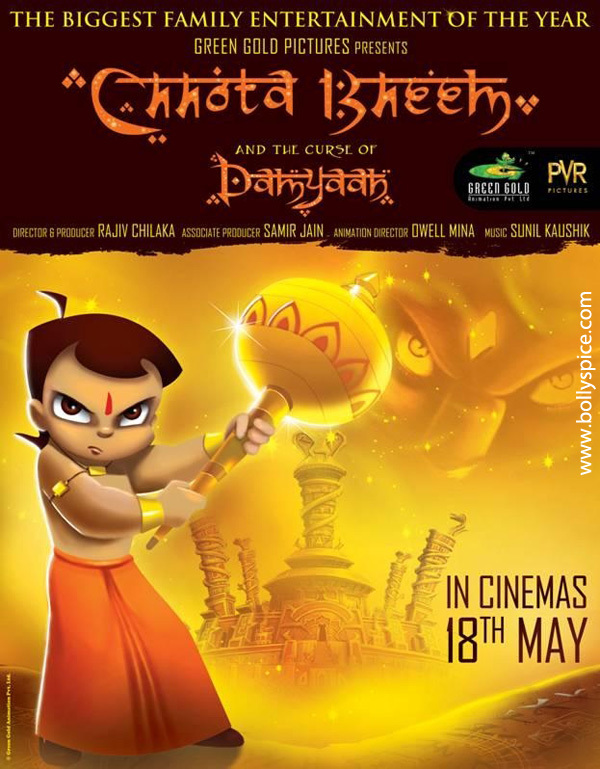 After the great success of Chhota Bheem TV Series on Pogo TV, India’s leading animated content producer Green Gold Animation in association with PVR Pictures is now releasing their first theatrical movie- Chhota Bheem and the Curse of Damyaan on 18th May 2012. The movie is directed by Rajiv Chilaka. Chhota Bheem and the Curse of Damyaan will be releasing in Hindi, English, Telugu & Tamil. It will be a fun-filled movie & kids will have a great time watching it. Chhota Bheem has become a phenomenon in India and it is competing with the best of the world. From the time, it has gone on air Chhota Bheem is consistently getting very good TRP ratings and it is helping Pogo TV to reposition itself as one of the leading kids channel. The story revolves around the famous characters – Bheem, Jaggu, Bholu, Dholu, Raju, Chutki & Kalia. Chhota Bheem and the Curse of Damyaan is a cartoon movie in which centuries ago, Damyaan a Sorcerer was granted a wish to be immortal by the “Book of Magi” with a rider/curse that he would be confined to the City of Sonapur. To escape from this confinement and to unleash his dark arts over the world, Damyaan lures Raja Indravarma with a map with the directions of the City of Gold. Despite warning from gypsies, the Raja sets out to seek the treasures along with Chhota Bheem and friends. Once he gets there, he unknowingly sets Damyaan free who captures Chhota Bheem and his friends and puts them in a prison. In a prison, Bheem meets with Santrik who tells him that the only way Bheem can defeat Damyaan is to destroy him with the “Book of Magi”. Can Chhota Bheem and his friends manage to defeat Damyaan and set Sonapur and Dholakpur free? 17 queries in 0.900 seconds.